T-rays are made by sending electrons zooming through a magnetic field, causing them to radiate electromagnetic waves that fit snugly between infrared and radio wave frequencies. Unlike x-rays, which are ionizing radiation, t-rays don't rip the electrons off atoms as they move through a material. This makes them safer for both the paintings and the people working with them. Despite their relatively low energy, t-rays can get through paint, ceramics, and plaster. Terahertz spectral analysis is done with a specialized machine that can send out t-rays. The rays penetrate a few layers of material, and reflect off of, or are absorbed by, what's beneath. The machine analyses the rays that come back to it, and creates a picture of what's beneath the over-paint. 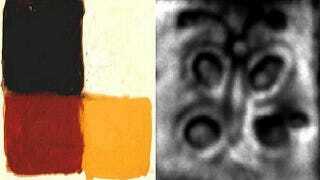 The image above, for example, shows a pencil sketch (right) underneath a layer of plaster and paint (left). The rays can be pointed at this stained glass window, from a 12th century church in Vendome, France, and distinguish between different materials of the same color - so that it's obvious that two panes of red glass were actually made of different materials, probably at different times. This false-color image shows the glass panes' colors based on materials. Now the two kinds of red can easily be distinguished. The red up top is cadmium red. Mary's blue robes are made of true ultramarine, except for the section shaded dark blue in the false color reproduction. That's false ultramarine. Someone must have replaced the glass at some point, or the people of the 12th century ran out of pigment. Much of the application for t-rays is in art, since they are able to preserve historic paintings much better than the comparatively rough x-rays. The rays are much like the radiation used in the infamous TSA 'backscatter' machines. But t-rays could also play a role in medicine. Their sensitivity could allow them to spot surface damage to teeth and exposed tissue before x-rays do and they're safer for everyone involved. They can also be used to scan food without contaminating it. They're effective through many different kinds of material. They can, for instance, tell the liquid level in a ceramic teapot without opening it. The rays add a frequency range that has so far been largely missing from medical imaging, and technology in general. Via Science News, Library of Congress, Light Sources, Ieexplore, E Conservation Online, and Electronics Express.